Ascorbic Acid (Vitamin C) can produce false negative results at high concentrations in urine samples. Convergys® Urine Matrix test strips are protected against interference of ascorbic acid in common concentrations. 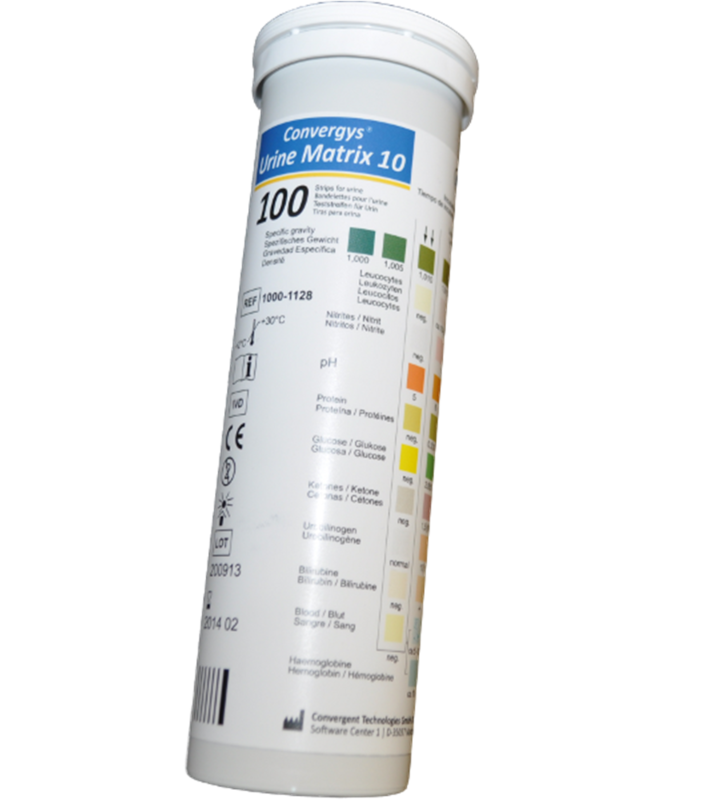 Convergys® Urine Matrix test strips for in vitro analysis provide useful screening information regarding the status of carbohydrate metabolism, kidney, liver function, acid-base balance and urinary tract infections. The method of screening patients for a wide range of diseases with urine test strips is a worldwide established method. Only the test parameters indicating pathological conditions need further examination. Convergent Technologies offers a range of easy to use urine test strips for screening several indications. The test strips can also be used for further follow-up and monitoring of risk patients. Convergys® Urine Matrix test strips can be used to identify several diseases in patients, like urinary tract or kidney infection, kidney failure, diabetes mellitus, high blood pressure (hypertension) and others. All Convergys® Urine Matrix strips tests can be performed within 1-2 minutes. With Convergys® Urine Matrix test strips you can screen the patients for a wide range of developing diseases. Convergys® Urine Matrix test strips are intended for in vitro diagnostic use. The visual method makes getting results easy with Convergys® Urine Matrix test strips.